These are those Alex expandable accordions that they sell to keep kids art in check. As you can see they did not work for us. You are probably thinking "pink for girl, blue for boy. She just needs to pare down". Those who know us will not be surprised to know that ALL of that is my daughter's. That girl loves art (see her I heart art shirt here). Each box is labeled with a child's name and age. So there is one box for 0-2, which holds birth mementos, baby hats, etc, and another box for preschool. I plan to keep adding boxes for each year of school, slowly moving them into our storage room as the kids outgrow each box. Right now I keep them in my home library. This is working well, since I can put important items in as needed, without going down to the basement storage. My most recent additions were the parent-teacher evaluations for my older two. I am keeping a *small* selection of artwork, but since these boxes are finite in size, as opposed o the expandable previous solution, it helps keep me in check. 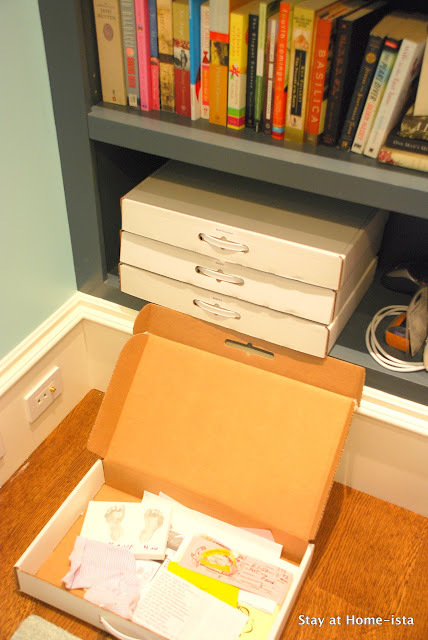 Feel free to get all crafty with these, it was all I could do to make sure that each child's baby box had everything in it; I had previously been storing baby mementos in show boxes in the nursery closet, not exactly as foolproof plan. Oh the paper! Drives me crazy. I have a similar system though. I use plastic boxes in the kitchen and then I sort it later saving some trashing the other. My kids love to color and paint so it gets to be crazy! I need something like that. Right now I have a whole drawer in Noah's dresser with baby mementos I want to keep. It needs to be organized though. I like these boxes! My second son loves to draw, too, so what I do is take pictures of his art work and save it on the computer. I can put as many pictures as I want! 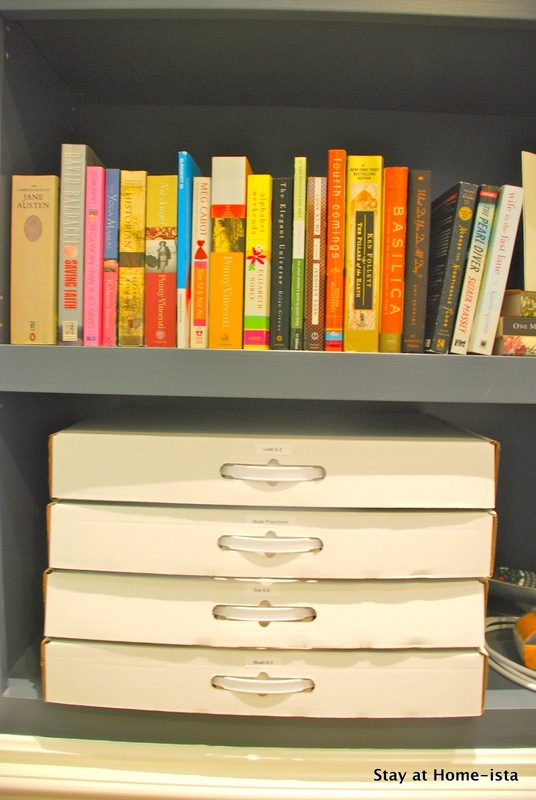 It's a great idea for controlling all that paper and stuff instead of sticking it in a drawer! Ooo, these are perfect!! I have to get some! That's a nice way to organize those special momentos that otherwise are so hard to store! Each of us kids had 2 under-the-bed storage boxes full of our old stuff growing up. Not sure where mine are now though haha! Hi Jessica, just wanted to let you know that I featured your beautiful home in a post I did today! Fantastic as always! My favorite part is that they are all uniform size. Brilliant! Great idea! My kids are 14 & 10 and I have accumulated a whole lot of art projects & school papers over the years. absolutely! i discovered these boxes awhile ago and love them...I put the photos in them too. Oh thank you, thank you. I've been trying to figure out what to do about the memento situation. Right now it's a pile on my dresser since the previous CD sized boxes are filled. This is perfect! Jessica, what size did you get? Do find it's big enough or too big? Oh man, great idea! I literally haven't let go of anything yet.. and he's not even to the drawing stage! I'm afraid this kid'll turn me into a hoarder. Love these! I do something similar with the paper suitcases from Paper Source. These will work MUCH better once my girl starts preschool. Noted! New follower here - found thru blog hop. Hope you will hop on over and do the same. What a great idea! I feel like this is something I could actually manage. 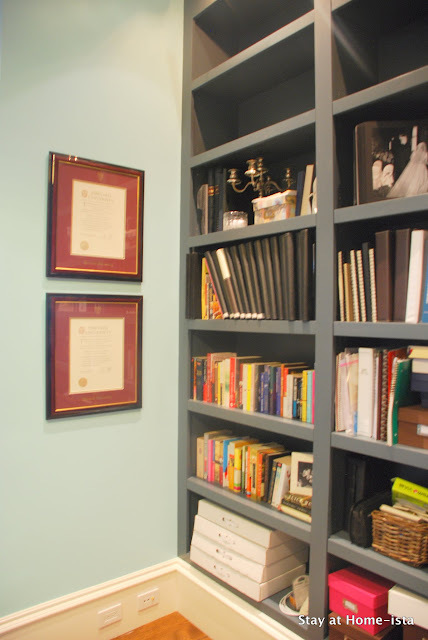 I get intimidated and give up when I see fancy scrapbooks, but this is totally manageable. Thanks for the tip! I love this idea! I don't have kids yet, but I can imagine that when I do I will be one of those parents who throws the art away when the kids aren't looking. I saw the idea somewhere (magazine? blog? who knows...) to keep all the art from each week in a single place (bin on the wall, stack on the counter) and then let the child choose one piece to keep each Friday. I'm thinking my tolerance will be one piece a month, though. Unless it's really really cute. Super late comment but I have a question: What size of those U-line boxes did you order? Thanks!